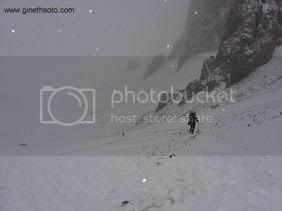 I've got a few pics of my Aconcagua trip, have fun! Congrats with your amazing preformance Mike! Great pictures! I love the pictures from camp 2. Such a beautiful sky! I don't know how many 7 summiteers there are, but we were about 20-25 at one point at the summit and there was space for at least 5 times that amount. The problem with a football match besides the lack of oxygen, is that if you drop the ball over on one side, it might take you a while to get the ball back (a drop of about 3000m). If you play a football game up there, I'm a good 5. This is the summit from another point. You can see the south face in the background. I'm the orange one. I Must admit that a quick run from one side of the plateau to the other side made me a bit dizzy. Nacho! Well done, thanks for your picture! 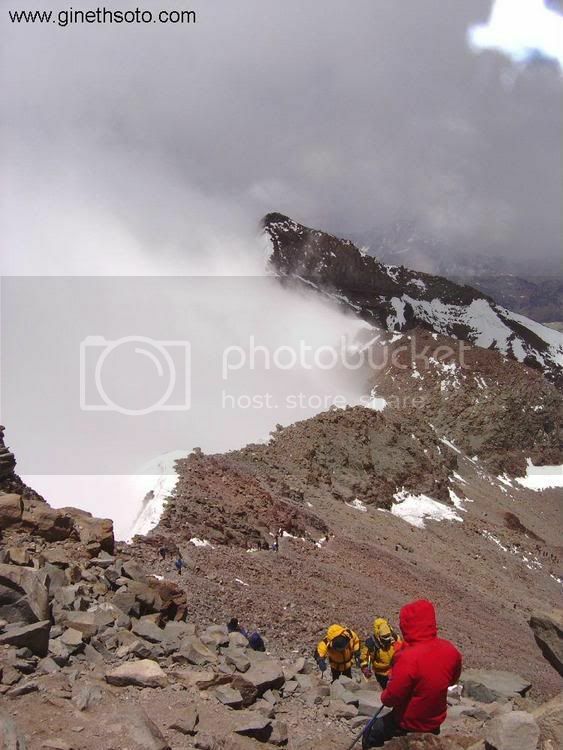 More Aconcagua pictures here, which can be sent as ecards. You can also register and upload your own, when they are approved you can send them as ecards as well. The polish traverse route.. From all pictures I have seen it looks like its an easy route. Off course I know pictures are lying a lot about the steepness but what is the crux with the traverse route besides altitude? Is it crevasses? Snowdepth? High angle slopes or perhaps navigation? First - great photos and big congratulations to MikeW, Nacho and Pura Vida! Acclimatized with four summits in Cordon del Plata (Vallecitos, Platita, San Bernardo and Cerro Plata). Went to Aco. Walked to Plaza Francia and tried to make it over to Plaza Argentina. Too much rock falls and too heavily loaded (some had over 30 kg on their backs) to make a safe climb over the ridge. Dumped the idea of making an approach via the Polish glacier and went for Plaza de Mulas. 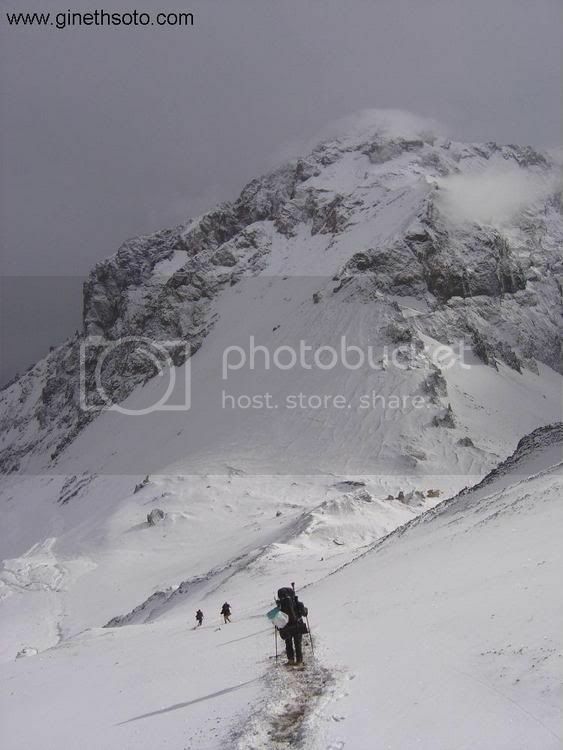 Climbed Cerro Manso and Bonete, failed to climb Cuerno via the direct route due to a crampon strap failure. Watched the circus in BC and let a blizzard pass. Quite amusing to watch horrified climbers (?) see their tents get airborne. For sure some of them pitched a tent for the first time in Plaza de Mulas. Went for Nido de Condores. Up to 6200m the next day. The weather could've been better, so I turned back. No rush. My girlfriend went at 07:00 from Nido and I left at 09:05. Cold and quite windy. Passed loads of grumpy and wasted Germans a bit under the summit. At 14:20 I was at the highest point of the continent. A beautiful day! Waited an hour and a half for my girlfriend to arrive and spent another 30 min on the summit after her arrival. The descent to Nido took a bit less than 3 hours. Why do most people attempting mountains like Aco the WRONG way? How smart is it to use mulas to carry the gear? Strutting easily with nothing on their backs to Plaza de Mulas. 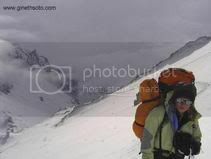 Basically collapsing when it's time to carry their own gear and that is when the altitude starts to kick in as well. For people who carry their own stuff it's the other way around. Watching the "carry-nothing-people" flying past on the walk-in and when it's for real, the people who are unsupported are the ones who're flying. Now Mercedario and at least 5 more 6000'rs are waiting. Take care and have fun, Corsair. All the pictures here are awesome! I can't wait to see more of your pictures Mike... Will you upload any to the image gallery here? 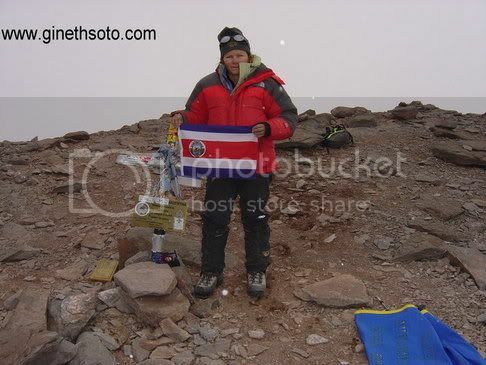 Also a BIG congrats to everyone who managed to summit Aconcagua!! !